A lo largo de la historia, el miedo y el temor han sido agentes activos que han generado cambios, animado resistencias, auspiciado movimientos contrarrevolucionarios, forjado imágenes, estereotipos y recelos frente al “otro”, además de originar violencia y represión. April 30, 2014, 11:00 a.m. to 5:30 p.m.
Eduard Ender (Austrian, 1822-1883). 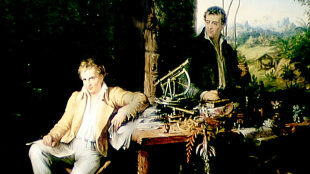 Alexander von Humboldt and Bonpland in the Jungle Hut, ca. 1850. Archive of the Berlin-Brandenburg Academy of Sciences and Humanities. Introduction: Wenzel Bilger, Regional Program Director, Goethe-Institute, New York. Respondent: Mary Louise Pratt, Silver Professor and Professor of Spanish and Portuguese Languages and Literatures at New York University.